One of the benefits of being middle-aged is that you've spent enough time on Earth to have bumped into some of your boyhood heroes. I had two - Kenny Dalglish, our greatest ever football player, and Jocelyn Bell, the Glasgow Uni physics graduate who discovered the pulsars while still a postgraduate student at Cambridge. I met them both, the latter in the men's changing rooms at the gym, the night before a Scotland game, the former in Astrophysics tutorials we were delivering jointly for the Open University. No hang on, it was the other way round, I think. There was a third boyhood hero I haven't met yet. But I will this week. The photo kinda gives it away. 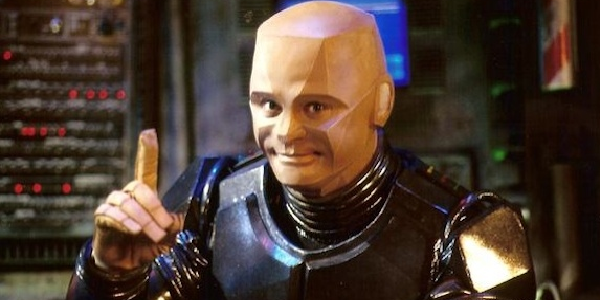 It's Kryten from Red Dwarf and we're interviewing him on Thursday. Now I know what you're thinking. "Kryten is a fictional character, son. You can't interview fictional characters." You might even be wondering if the solitary, self-denying life of a writer has finally unhinged my brain. Well no, not yet. The actor who played Kryten is called Robert Llewellyn, and here's what he said when asked if he'd chat to us for our Three Minute Engineering project. "What a wonderful idea and I'd be happy to offer my two-penneth, with the reminder that I'm not an engineer, I've just met a huge number of them and admire what they do. "Thursday is the only day I'm free next week and I'm at home in the Cotswolds, so we could meet up in the morning. How about here: ---- Very nice place, parking nearby." Judging from his blog, Lewellyn is a very good guy, although a lot less adept at ironing than Kryten. So I'm looking forward to the meeting, but probably won't ask him to iron my shirts. It gets harder all the time to find anybody who will. Once we've done the work part, I plan to sneak in a small request that Robert do a couple of Kryten lines from one of my favourite scenes. I don't expect he gets asked that kind of thing more than six times a day. So that's about it for this week, dear reader. I'll let you know next weekend how it went. What's that you say? How can Kryten have been a boyhood hero of mine when the first episode of Red Dwarf aired in 1988? Well yeah, you got me. He was actually my sons' hero. They were big fans and we used to watch the series together, comfortably ensconced on the sofa at my house, after their mum and I separated when they were 10 and 11. Nice memories. Just one thing more. After Jocelyn Bell and I worked together our trajectories went in different directions and in 2007 she was made a Dame Commander of the Order of the British Empire. I suspect it's just slipped somebody's mind, and there might be one in the post, but I've received no awards since the age of 11, when I got an Honourable Mention in the Burns Day poetry competition. Dame Douglas has a nice ring to it, don't you think? PS I did have one more boyhood hero, as regulars here know well. If you read this, Ringo, gimme a call.